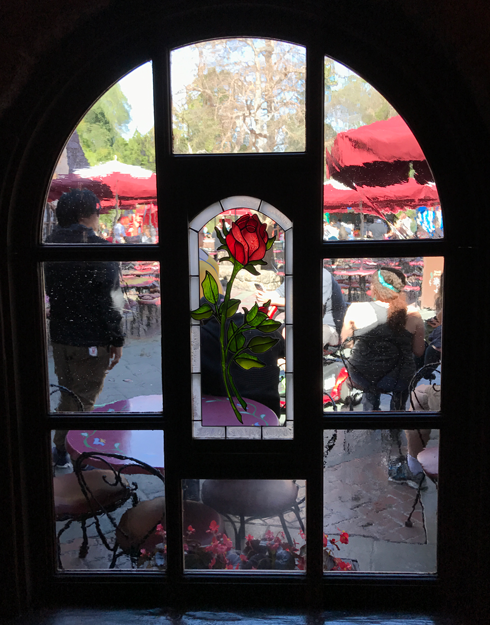 If you're as excited about the live-action Beauty and the Beast film as we are, then you'll be happy to hear that Disneyland has undergone a ~makeover~ to celebrate the film's upcoming release. 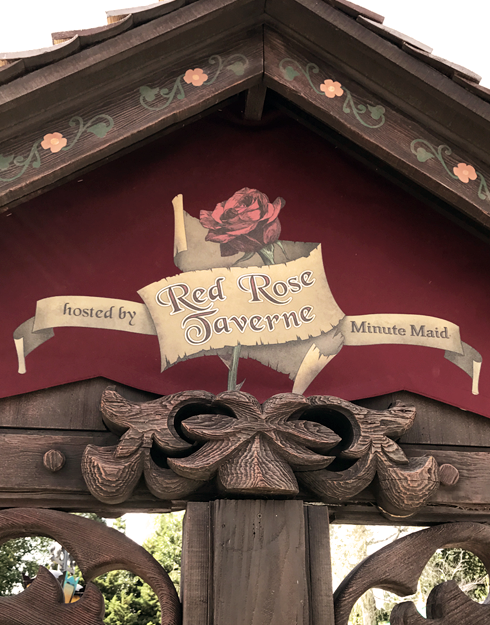 First of all, the Village Haus Restaurant has been transformed into the Red Rose Taverne. Normally, it's a Pinocchio-themed eatery. 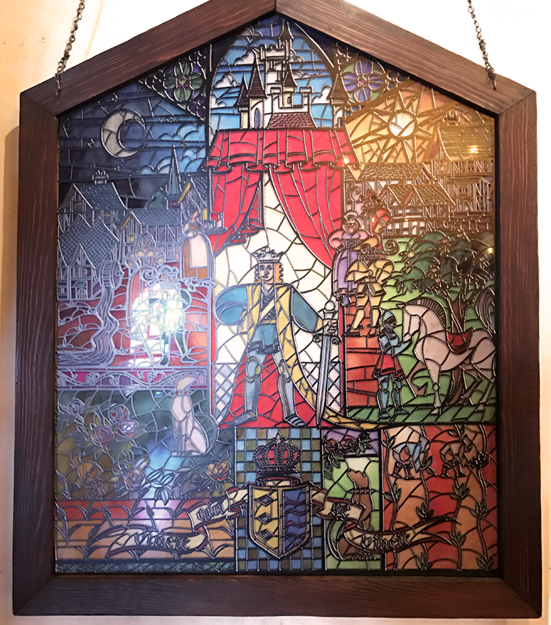 There's even a portrait of Gaston that's roughly the size of a barge. As a specimen, yes, it's intimidating. "But what about the FOOD," you ask? Well...tie your napkin 'round your neck, cherie because there's also an entirely new, very impressive menu offered at the Red Rose Taverne. You can indulge in dishes like poutine topped with slow-cooked beef, roasted garlic aioli, cheese curds, gravy, and herb oil. Fancy with a big ol' capital "F."
Or an insanely good vegetarian option: a cauliflower steak sandwich which has spicy lime aioli, tempura-battered green beans, and is basically nicer than anything I could ever make myself at home. I'm not even a vegetarian and this was probably my favorite dish. And no rustic meal would be complete without a mug of Gaston’s Famous Brew – an apple and mango punch topped with passion fruit foam that's OMG SOOOOOO good. Now – drumroll, please – yes, there is actual GREY STUFF, too!!! This is Disneyland's special take on the "Grey Stuff" – there's a slightly different version available at the Magic Kingdom – and it's basically white chocolate mousse covering a red velvet cake with a raspberry center, served on a shortbread cookie. And you don't need to ask any dishes if it's delicious, because I'll just tell you... IT IS. ::Whispers:: You can even get a Grey Stuff baked pastry twist (AND Grey Stuff dipping sauce!) at Maurice's Treats next to the castle. Shouts: "Marie! The Grey Stuff Twists! Hurry up!" 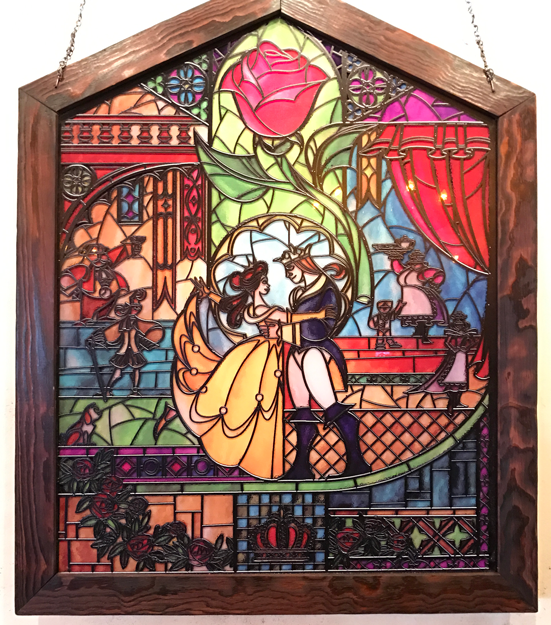 The Royal Reception building, which used to house the Frozen meet and greet, is now a ~pop-up~ Beauty and the Beast shop, too. But what would a true Beauty and the Beast experience be without some flatware, er, characters entertaining, right? ...and surprise performances by Belle and the Beast themselves with the Disneyland band! The band is VERY good, BTW. Also, be sure to keep your eye out for a roaming, hilariously sassy, Gaston. Ask him to flex his biceps...he loves that. Because he'll happily pose for a photo with you – well, really a photo of him with you somewhere in it, which is good enough, TBH. *Record scratch* *Freeze frame* "Yup, that's me. You're probably wondering how I ended up in this situation." There's nothing quite like THIS provincial life!